One afternoon late last month, in the Swedish Lapland, I take a somewhat apocalyptic bus ride. The blustery snow outside and pitch-black winter day mean it is impossible to see beyond 10m ahead. We pass by stationary trucks, abandoned by their drivers. Every few kilometres, our driver, Per Anders, has to get out to clear the snow off the hardworking windshield wipers. He drives carefully, in part to avoid hitting stray reindeer. "Welcome to the Arctic, folks," he says cheerily. Kiruna, part of the Swedish Lapland in northern Sweden, is the kind of place where people boast of eyelashes that freeze when it snows. Water-based skin lotions, if not allowed to dry sufficiently, can cause frostbite. Cameras and phones can stop working - a big nuisance, considering that its location in the Arctic Circle makes it an ideal spot to view the Northern Lights. From Singapore, fly to Stockholm and take a domestic flight to Kiruna. The journey takes at least 17 hours, including transit time. You can opt to make a pit stop in Stockholm to take in some of the capital city's sights before or after your trip to Kiruna. As the weather can dip to minus 30 deg C and below, it is crucial to wear quality thermals. Waterproof outer layers are also a must, as you will be walking around in the snow a lot. Buy heat packs for your hands and body if you need extra warmth. Rental snow boots and snow suits may be available at certain hotels. These are good for activities such as dog-sledding or waiting for the Northern Lights. But do not overdress when you stay at the Icehotel as you will wake up feeling hot. The thermal sleeping bags will keep you warm as long as you zip them up all the way. Nothing is for certain when your activities depend on the weather. A trip to Narvik in Norway was cancelled, as the roads were closed due to heavy snowfall. A chairlift ride up to the Aurora Sky Station at Abisko was also suspended for safety reasons. Keep an open mind. Indoor activities, such as the Aurora Spa at Camp Ripan, can be enjoyable as well. Locals come to this spa, which has indoor pools and several saunas, to relax and rejuvenate. Phone apps and a good guide can help you determine the probability of seeing the Northern Lights. But you might have to wait outside in the cold for hours before you see anything. Your DSLR camera should come with adjustable settings and a tripod. Batteries tend to get sapped faster in the cold, so pack spare ones. At times, your camera might capture the lights, even if your eyes do not. But remember not to fixate on the camera and try to enjoy the view. But with the right clothing, attitude and sense of humour, winter in Kiruna is an experience to be savoured. Cold is a relative term. I learn this as I zip myself into a thermal sleeping bag in my minus 5 deg C room in the Icehotel 365 (www.icehotel.com). It is three times as cold outside. The 2,100 sq m Icehotel 365 is the newest addition to the 27-year-old Icehotel establishment and a permanent one. Icehotel consists of multiple buildings, including the original "winter hotel", which melts in summer and has to be re-constructed every year. The buildings are made from "snice", a combination of snow and ice - it has a translucent quality - from the nearby Torne river. In the Arctic Circle, the sun does not set for about 100 consecutive days - a phenomenon called the midnight sun - in the summer. Solar panels in Icehotel 365 harvest this solar energy that is then used to cool down the hotel during the summer months when temperatures can climb to 30 deg C.
There is a trick to staying warm. Our guide, Fredrik Stefansson, warns us of travellers who have piled on the layers, only to wake up sweltering in the middle of the night. Dressed as he advised - one layer of thermal, a beanie and warm socks - I am so cold I sprint through the snow to the Icehotel 365, where my room is. My belongings are kept in a dressing room in a separate building to keep them safe and dry - there is no storage space in my room and there is no lock on the door. I am staying in an Art Suite, where the rooms all bear unique designs by artists from around the world. My room, named Melting Pot, has walls with a million circular indentations. There is also a large globe in the side of the room made of brick-shaped ice. I read later that British artists Rob and Timsam Harding had wanted to remind people of global warming, but feeling warm was unfortunately the last thing on my mind. Still, I appreciated the design. Touring the rooms earlier that day - they are open to the public from 10am to 6pm daily - I see that some have designs that may well have taken cues from famous Austrian psychoanalyst Sigmund Freud. In one, there is a giant sculpture of a deer sliced in half; in another, aptly named Audience, a wall of faces look at you while you sleep. Both invoked the notion of repressed memories and the power of the unconscious mind. Thankfully, the mattress I sleep on is a regular one. My sleeping bag also sits on top of reindeer skin, which makes it extra comfortable. But there are little quirks that remind me I am sleeping in what is essentially a freezer. Getting into bed, I have to consciously avoid touching the thick block of ice the mattress sits on. Thankfully, I realise the only way to get good sleep is to keep out the cold by zipping the sleeping bag way over my head. At 7.30am, a hotel staff makes her morning rounds to wake guests up, as the rooms must be prepared for a new round of public tours. She comments on my deep sleep, which makes me feel strangely proud of myself. Then, she passes me a cup of warm lingonberry juice. I drink it with a delightful shiver. Land-to-table is the way people dine in the Swedish Lapland. 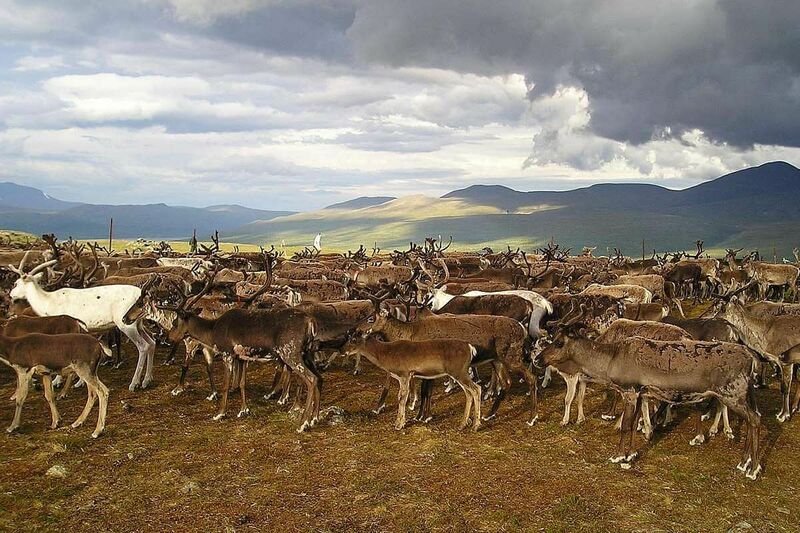 Reindeer, belonging to the indigenous Sami people in Lapland, roam freely outside. They are also a main meat source. We have it in fillet form, medium rare, paired with mashed potato and the ubiquitous sweet lingonberry sauce at Camp Ripan (ripan.se). We have the meat smoked and sliced thin. We have it in little cubes, as a garnish in mushroom soup. At the Icehotel, I have the classic five-course Ice Menu in its restaurant, where food made of fresh ingredients is served on tiny slabs of ice. I am given a tiny egg-shaped dollop of whitefish caviar served with shavings of onion; leafy lichen (a type of algae that reindeer eat) and a slow-cooked fillet of elk paired with blueberry jelly. Everything tastes fresh, foreign and delicious - except perhaps the lichen, which lacks flavour, but is extremely crisp. Besides lingonberry, which any self-respecting Ikea fan should know about, cloudberry (bitter- tasting) and arctic bramble (similar to raspberry) make frequent appearances on my plate, in savoury and sweet meals. At another meal, as part of a specially organised Taste of the Arctic experience, wilderness guide and chef Anders goes the extra mile by catching his own Arctic char, a type of fish, for dinner. We are supposed to dine in an igloo built by Mr Anders, but plans change due to a windy snowstorm. So, instead, we adjourn to a wooden cabin in Bjorkliden, complete with a fireplace (bjorkliden.com). Still, we get a taste of the outdoors as he tells us of his experiences. Once, he fended off a moose with a hoe after it wandered into his garden, coming scarily close to his young child. "I was fighting a moose and it was stupid of me," he says with a cheeky smile. The creature eventually scampered off. To round off the meal, he serves us kaffeost - coffee with cubes of spongy cheese inside - which apparently only one 80-year-old woman in north Kiruna knows how to make. I am not impressed with the rubbery, tasteless cheese, but can appreciate that this traditional drink is a way for locals to get a dose of protein while keeping warm in winter. Unsurprisingly, there is a Swedish term for the feeling of wanting to be warm and cosy, eat good food and enjoy good conversation - mysig. Parts of Swedish Lapland are perfectly placed in the Aurora Oval, a region in which the Northern Lights can usually be seen. The best time to spot it is during the winter months, especially in areas which are dark and have a view of clear skies. But there are many reasons why a traveller may miss the lights - dense cloud cover or light pollution, for example. The Sami people believe that the lights are the souls of their ancestors. Children are told not to whistle at the Northern Lights, lest they be whisked away by spirits. I like this reverence for the lights. It is better than thinking of them as a show for tourists. I feel lucky when the lights finally show themselves to me on a night at the base of the Aurora Sky Station (auroraskystation.se) - a ribbon of green rippling in the sky before disappearing. But to be honest, the beauty of the Swedish Lapland is revealed in so many other ways as well. Towards the end of our trip, we meet local guide Ida-Maria Svonni (sapmilife.com), a Sami woman whose family herds reindeer and moves according to the season. "We are the people of the sun and the moon. We live a life in harmony with the reindeer," she says, her face reflecting the fire she had built in the lavvu, the teepee-like shelter that we sit in. She shows us photos of her young daughters learning the ways of their community and says with quiet conviction: "The children are the future." Going back to that apocalyptic bus ride, I unexpectedly encounter The Beatles. As a sliver of sun breaks through the clouds, Mr Anders starts singing Here Comes The Sun. He has not seen the sun in days and a single ray is worth breaking out into song for. I realise then that it is all about contrasts co-existing - the beauty in isolation, the cosiness in the bitter cold, that rippling green strip in the black sky. It is not the end of the world after all. It is only the beginning. Parts of its town - including the city centre, 3,200 homes and 6,000 people - is relocating 3km east. This is necessary because an iron ore mine beneath the city is leaving cavities behind which will eventually collapse. "We wouldn't be here if it wasn't for the mine," says Mr David Lind, market director of Kiruna Lapland Economic Association, comprising local companies and the municipality. 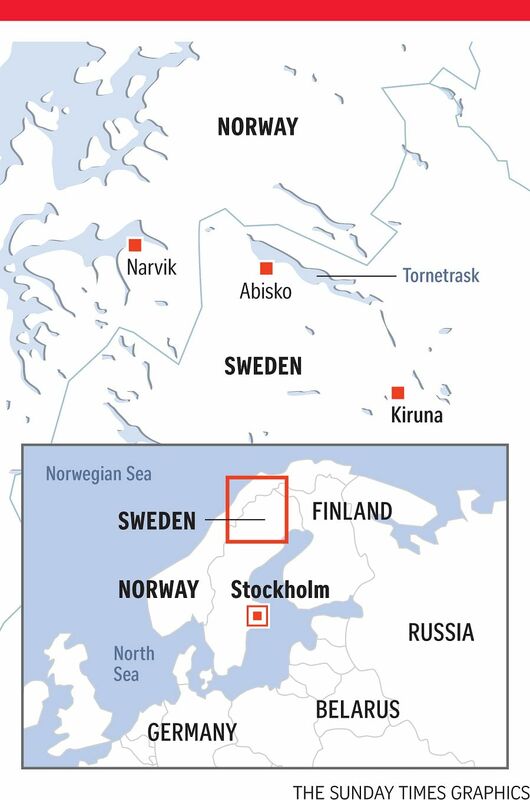 Kiruna is home to the largest iron ore mine in the world, run by Swedish mining company LKAB. The mine came first, built in the 1890s, and the city developed around it. The mine produces 90 per cent of the iron in Europe today. Mr Hjalmar Lundbohm, the first managing director of LKAB, is considered the city's founder. There are guided tours of the mine (kirunalapland.se; 360 Swedish kroner, or S$56, an adult for a two- hour, 45-minute tour). The redevelopment, expected to continue till 2035, will beautify the industrial-looking city. There are plans to have "a green area running through the city centre where snow mobile and dog-sledding companies can pick up and drop tourists in the city centre", says Mr Lind, 35. The new main city square is targeted for completion by 2019. He also hopes that more tourists will come to appreciate summer in Kiruna. The Northern Lights has made winter a popular period for international tourists from December to March. But traditionally, Kiruna has been popular as a summer destination among locals, who go there for outdoor activities such as hiking, fishing and whitewater rafting. Another interesting thing about Kiruna is that it is the site of major international space research. One company, Spaceport Sweden (spaceportsweden.com), stands out with its aim to offer commercial flights to space launched from Kiruna. But this is not the city's only quirk. Mr Lind says: "You can see the Northern Lights as early as September and hike and fish in the day. In the summer, locals come and they ice-fish in a T-shirt." • The writer's trip was sponsored by Off The Map Travel (www.offthemaptravel.sg). • The five-day, four-night Northern Lights adventure itinerary in the Swedish Lapland costs from £1,950 (S$3,433) a person, based on two adults sharing, with some meals included and excluding flights. This includes one night in the Icehotel, one night at Camp Ripan including the Aurora Spa, two nights in Bjorkliden with dog-sledding, a trip to Narvik in Norway, the Taste of the Arctic wilderness experience and dinner at the Aurora Sky Station. Some activities are subject to the weather.